YOUR BABY HAS JUST STOPPED BREATHING. WHAT ARE YOU GOING TO DO? A friend’s baby has just been pulled from your back-yard pool. Could you administer life saving CPR? What is a febrile convulsion, a seizure or fit? Do you need to call an ambulance? Do the Grandparents know what to do if your newly weaned baby is choking? Every second counts…. Allergies and anaphylactic shock….do you really know the symptoms and what to do in an emergency? These are all scenarios that none of us want to ever encounter but all should be prepared for. Duck and Dive Baby Swim School have teamed up with midwife and Parentmedic Ambassador Gemma Deng to help educate you and all carers on essential first aid for your precious child and become competent first aiders! So what does “Parentmedic” exactly mean? In Gemma’s case, she is a mum to a young son so that’s the ‘Parent’ bit, and secondly, a midwife and has been for over 10 years, the ‘Medic’ bit – and you can be too! The Parentmedic Movement, is a group of healthcare professionals who are passionate about educating parents and carers in the life saving ways of Baby and Child First Aid. Their Vision is that every child in the world, is cared for by someone with the confidence and knowledge to keep them safe and supported. 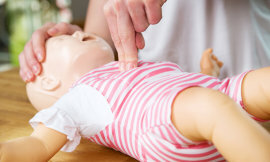 Ask yourself this question…..does everyone that cares for your child have the knowledge to give immediate and potentially life saving first aid to your child? With grandparents taking a more active roll in caring for their grandchildren, would they know what to do if your child was choking? Could they appropriately manage a febrile seizure? Why not discuss this with the whole family and invite them to be involved in these sessions. It could save a life. We are baby friendly! All participants are welcome to bring their babies/children, and feed, push prams or whatever you need to do! Parking: Free on site and street parking available. Check back for new dates coming soon…..or contact us to be advised of the next session. If these times don’t work, we also provide 2 hour private sessions in your home for small groups of 6 or more, so if your have a mothers group then this could be the perfect activity. Cost $60.00 per person.